The world faces many crises, but no country can match Russia’s ability to weigh in, tip the balance of power, and seize attention. It has used its abundant supplies of natural gas to advance political goals; it intervened in Ukraine when it felt that those who sympathized with Russia were threatened; its military support has given President Bashar al-Assad’s regime new life in Syria. So, given Russia’s power and the palpable chill every time Vladimir Putin and Barack Obama meet, is Russia America’s biggest foreign threat? NPR “Morning Edition” host and former Moscow correspondent David Greene visits Zócalo to try to answer this question. He is the author of Midnight in Siberia: A Train Journey into the Heart of Russia, an account of his epic trip on the Trans-Siberian Railroad to understand where Russia is going and how its people feel about that uncertain path. Below is an excerpt from his book. I struggle awake, and there she is. Russia. A silver-haired grandmother in a flowered nightgown. She’s framed by the morning sunlight flooding through the dusty windowpane. And she’s holding a glass of water before my crusted eyes and parched lips. Here she stands, fresh and awake, despite last night’s marathon conversation about politics, childhood, dogs, snow, soccer—whatever her nephew Sergei served up next—that lasted far beyond my vodka-laced endurance. Forty years younger and barely mobile, I could be jealous of her energy or humiliated by it. Above all I just need that water. I blame Russia. No, Russia didn’t ram seventeen shots of vodka down my throat. But Aunt Nina’s family is so warm, and so persuasive. That’s what Russia does to the uninitiated at night. And now she’s greeting me in the morning—not very forgivingly. “Dobroe utro!” That’s Russian for “Good morning,” delivered in a tone that mixes sweet and stern. Her pursed lips, tight with impatient disappointment, indicate I have only five minutes to roust myself from this bed. What fond memories of the night before! The table was crowded with Aunt Nina’s creations: Piping hot borscht (the venerable Slavic soup made of beets) usually with dollops of sour cream to make it creamy, potato pancakes stacked in towers, tender stewed chicken drowning in some addictive red sauce, and vegetables pickled to perfection. Serving dishes inhabited every open piece of real estate. And the night was crowded with Russian proverbs—which I am convinced Sergei’s family members were authoring on the spot. Nights around the dining room table don’t end. In Soviet times this was sacred ground, a hiding place where it was safe to smile and laugh and talk openly. And traditions don’t die easily in this country. Why should they, when they’re this merry and liberating? More vodka means more stories, which mean more laughter, which means more vodka, which brings us to the morning. I am guzzling water, peering sheepishly over the rim of the glass at Aunt Nina and Sergei, my friend and colleague. They are vertical, staring down at the patient with a combination of bewilderment (vodka is rarely this damaging around here) and hope (if my hangover progresses to the next stage, it will be messy for all involved). It’s 9:30 a.m., and Sergei and I have a meeting in an hour, so I promise to shower promptly. “Bystro [Go quickly]!” Nina says, clapping her hands twice for emphasis. I limp into the shower, turn on the faucet, and let the stream of water serve as a masseuse for my aching head. Beyond therapy, hangover showers serve another purpose in life, and that’s reflection. And here in Aunt Nina’s shower, I can’t stop thinking about how my experience of the past twelve hours has been so … Russian. My morning nurse is the embodiment of the Russian babushka, or grandmother—the term really applies to any older Russian woman. A word of caution: When you say “babushka” out loud, put the emphasis on the first syllable—“BAH-boosh-kah.” (By comparison, a “bah-BOOSH-ka”—an English-language invention that doesn’t exist in Russian—is a scarf. And calling a tough old woman a scarf doesn’t get you far around here). If Russia had a mascot, it could well be a babushka. In paintings or photos that capture Russia, you may have seen older women, selling fruit along the road, wearing babushkas (yes, this time, scarves). That’s one rendition of the babushka. There is also the urban babushka, like Aunt Nina. She lives in the western Russian city of Nizhny Novgorod, in the apartment she and her late husband were assigned to during Soviet times. Rural, urban, or otherwise, babushkas are known to be strong and self-sufficient. Many lost their men years ago to hard work or alcoholism, in many cases both. They are the engine and spirit of Russia’s older generation, and in some ways of the whole country. Aunt Nina has boundless energy, can talk for hours about literature, loves to cook, and gives tough love. She lectured me and Sergei for drinking too much, then talked soused Sergei to sleep (I needed no help), and then rushed in the morning to deliver me water and sympathy. Of course, all the warmth and love I felt during this visit was within the confines of a family’s home, which brings up an important point: On first impression Russians are generally not friendly people. You come to understand these tendencies. In Soviet times being in public was risky. If you accidentally spoke to a stranger who was under suspicion from the government, or told a joke about Stalin, or appeared too friendly with a foreigner, it could mean interrogation or in extreme cases worse—a journey to a Siberian prison camp. Many Russians developed coldness in public as defense, suppressing thoughts and feelings, not letting their true selves escape. And while the risks of putting yourself out there are far less severe in today’s Russia, remnants of that behavior remain. During three years living in Moscow, my wife, Rose, and I slowly adjusted to this. If someone slipped on the ice or was otherwise in need of help, strangers would often just walk by pretending not to notice. Why risk getting involved, especially if the police were being called? Rose and I would be the only people coming to someone’s aid, doing all we could with limited Russian-language skills. A British diplomat friend once saw two teenage girls hit by a speeding car as they were running across a street. One of the girls was decapitated. The driver just sped from the scene. Our friend stopped his car, called an ambulance, and ran to the other girl, who was screaming uncontrollably next to her friend’s body. All the while, cars passed and pedestrians walked by as if nothing was out of order. While seemingly cold and vacant to strangers on the outside, many Russians are beautiful and generous on the inside. Their public disengagement can be shocking, but they are some of the warmest people on earth. Once they get to know you and invite you into their homes, many Russians will freely share their stories, traditions, and food. When you enter a home, two things happen: You are offered a pair of slippers—polite encouragement to take off your shoes and make yourself comfortable—then you are offered tea or vodka. I spent many days hoping for tea and getting vodka. Whatever is in the glass or on the plate, however, there is no higher honor in Russia than to be welcomed to a family’s table and treated as one of their own, which was the case in Aunt Nina’s apartment. 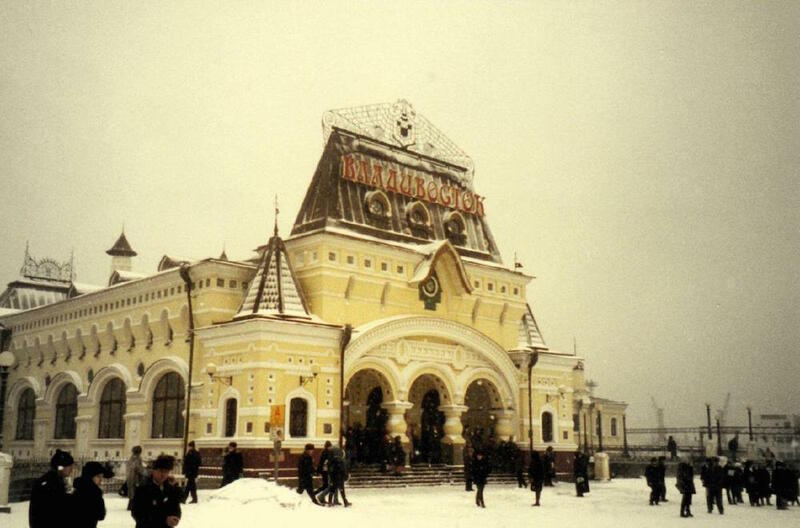 Excerpted from Midnight in Siberia: A Train Journey into the Heart of Russia by David Greene. Copyright © 2014 by David Greene. With permission of the publisher, W.W. Norton & Company, Inc.